First, I want to start with a housekeeping note. Your author will be travelling for work and then a short autumn holiday. And so while I may be able to sneak a post or two in, I generally would not expect anything until next Friday, 12 October. But let’s end this string of posts with a map. 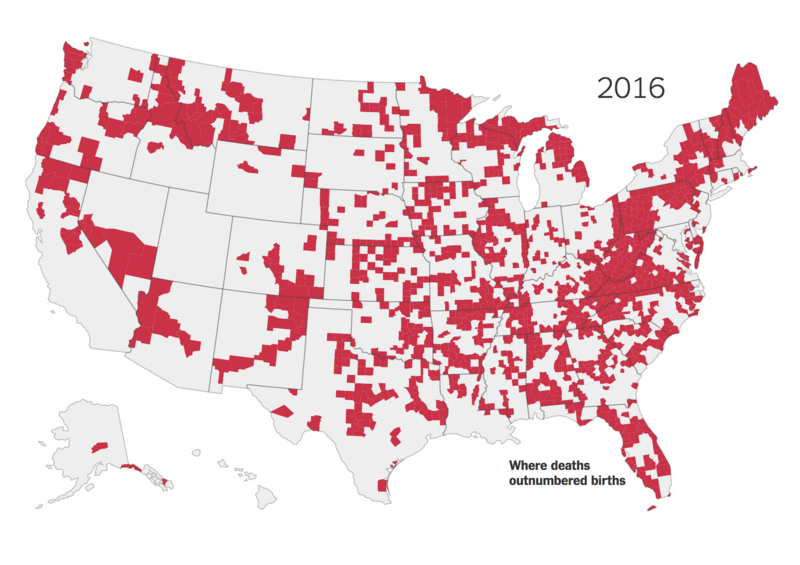 It is a choropleth, so in one sense there is nothing crazy going on here. The map comes from the Economist, which published an article on life expectancy throughout Europe and the big takeaway is that it is lower in the east than the west. The great part of the map, however, is that we get to see a more granular level of detail. Usually we just get a view of the European states, which presents them as an even tone of one shade or one colour. Here we can see the variety of life expectancy in the UK, France, and Belgium, and then still compare that to eastern Europe. Of course creating a map like this demands data to drive it. Do data sets exist for the sub-national geographic units of EU or European states? Sometimes not. 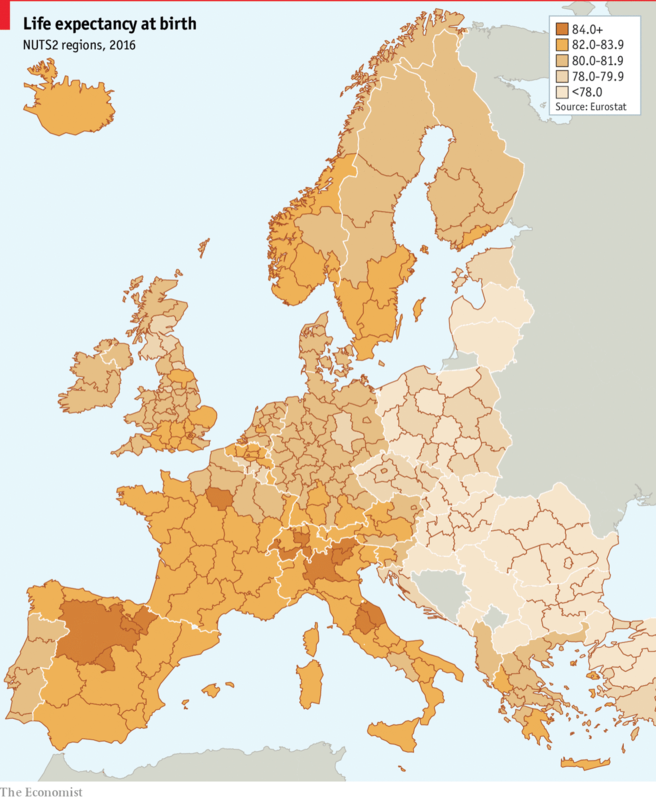 And in those cases, if you need a map, the European state choropleth is the choice you have to make. I just hope that we get to see more data sets like this with more granular data to present a more complex and patterned map. As you all probably know, Hurricane Florence crashed into the Carolinas this past weekend. And while I was on holiday, I did see a few articles about the storm and its impact. This one from the New York Times captured my attention because of its use of—surprise, surprise—maps. In particular, as the user scrolls through the experience, he or she sees the change in population density of the region from 1990 to 2010. Spoiler, a lot more people now live near the coast. In terms of the graphic, however, I wonder if a simpler approach could have communicated that part of the story more clearly. Could the map have simply shown the change in density instead of visually transforming from one number to the next? Or maybe a summary map could have followed those transitions? Credit for the piece goes to Stephen M. Strader and Stuart A. Thompson. Last week Angela Merkel, the German chancellor, visited President Trump in Washington. 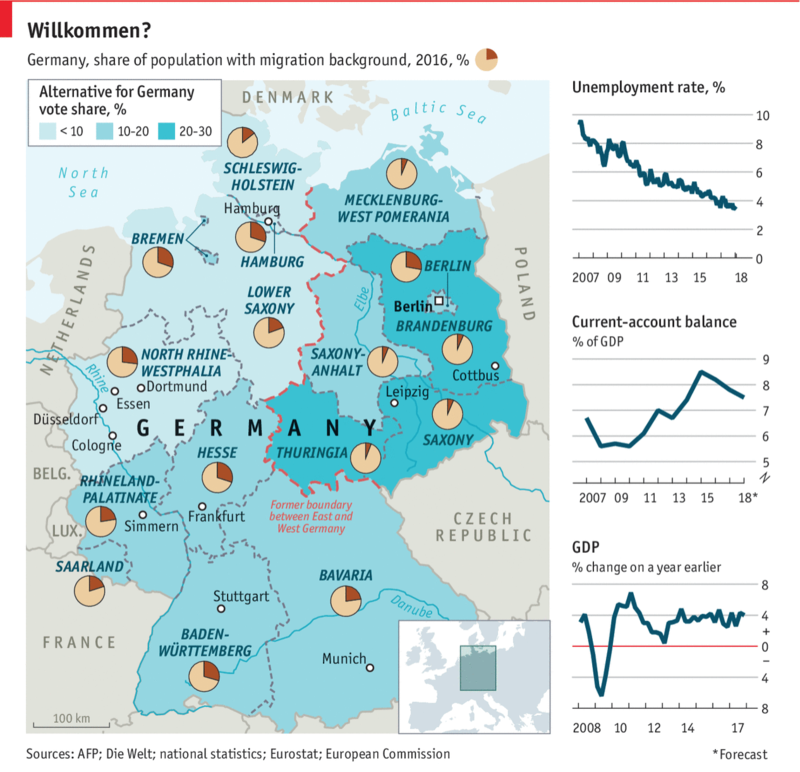 This post comes from the Economist and, while not specifically about that trip, describes Germany in a few different metrics. Back in the day it would be what I called a country-specific datagraphic. That is, it shows metrics not necessarily connected to each other, but all centred around a country. In theory, the framework can then be used to examine a number of different countries. That sort of works here, except the choropleth is for the Alternative for Germany political party. That only real works as a metric in, you know, Germany. Overall, I like the piece. The layout works well, but Germany is fortunate in that the geographic shape works here. Try it with Russia and good luck. First let us dispense with the easy criticism: do we need the box map in the lower right corner to show where in the world Germany is? For Americans, almost certainly yes. But even if you cannot identify where Germany is, I am not certain its location in Europe is terribly important for the data being presented. But the pie charts. I really wish they had not done that. Despite my well-known hatred of pie charts, they do work in a very few and specific instances. If you want to show a reader 1/4 of something, i.e. a simple fraction, a pie chart works. You could stretch and argue that is the case here: what is the migrant percentage in Bavaria? But the problem is that by having a pie party and throwing pie charts all over the map, the reader will want to compare Bavaria to the Rhineland-Palatinate. Mentally you have to take out the little red slice from Bavaria and then transpose it to Rhineland-Palatinate. So which slice is larger? Good luck. Instead, I would have left that little fact out as a separate chart. 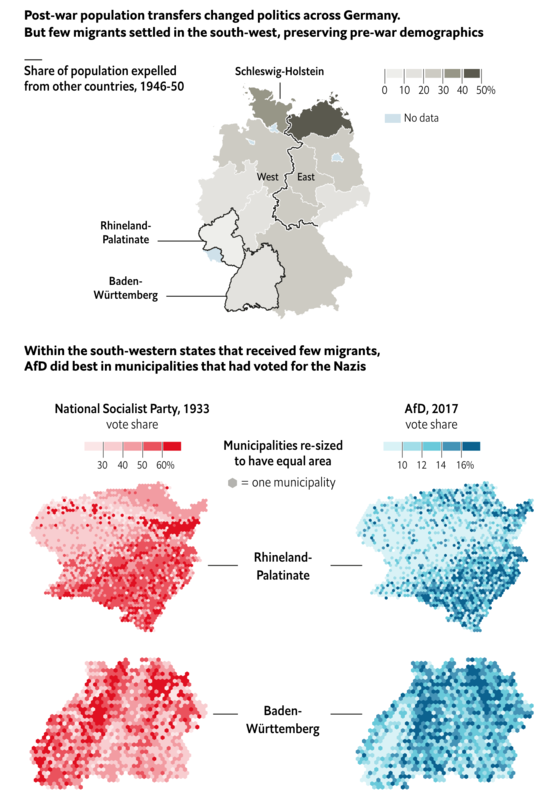 Basically you need space for 16 lines, presumably ranked, maybe coloured by their location in former East or West Germany, and then set in the graphic. Nudge Germany to the left, and eat up the same portion of Bavaria the box map, cover the Czech Republic, and you can probably fit it. The point is that I still hate pie charts. The New York Times has posted a nice piece with an animated graphic. No, not that piece, I’ll probably cover that next week. This one looks at demographic changes in the United States, specifically in the population change at county levels. A number you arrive at by subtracting deaths from births and excluding migration. Basically what we are seeing is a whole lot of red outside the major cities, i.e. the outer suburbs. The article does a nice job of explaining the factors going into the declines and is well worth its quick read. Credit for the piece goes to Robert Gebeloff. Here in Pennsylvania this week, the state Supreme Court will hear arguments on the legality of congressional districts drawn by Republicans in 2010. The state is rather evenly split between Republicans and Democrats, e.g. Donald Trump won by less than one percentage point or less than 45,000 votes. 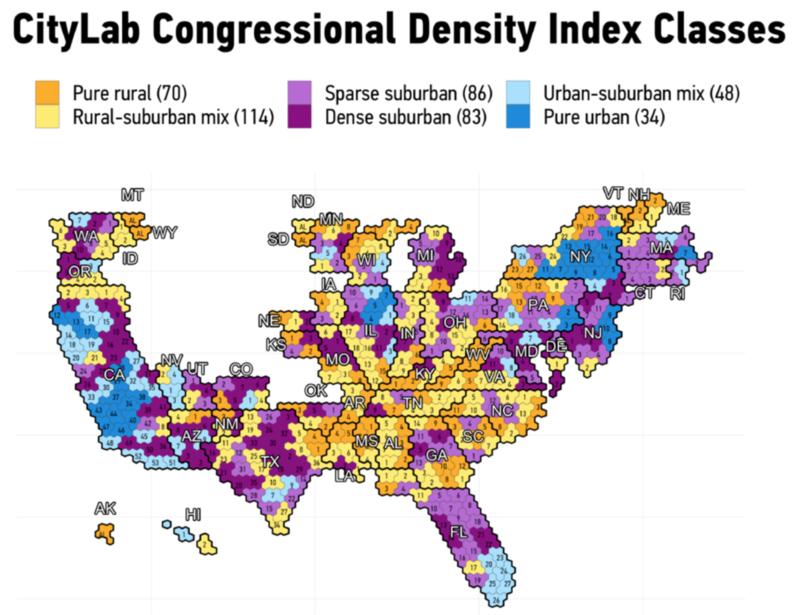 But 13 of its 18 congressional districts are represented by Republicans, roughly 72%. This graphic is from the New York Times Upshot and it opens a piece that explores gerrymandering in Pennsylvania. The graphic presents the map today as well as a nonpartisan map and an “extreme” gerrymander. The thing most noticeable to me was that even with the nonpartisan geography, the Democrats are still below what they might expect for a near 50-50 split. Why? One need only look at Philadelphia and Pittsburgh where, using the Times’ language, the Democrats “waste” votes with enormous margins, leaving the suburban and rural parts of the state open for Republican gains. Credit for the piece goes to Quoctrung Bui and Nate Cohn. Last week I covered a lot of Red Sox data. And your feedback has been fantastic. I think you can look forward to more visualisation of sportsball data. But since this is not a sports blog, let us dive back into some other topics. Like today’s piece on economic growth. It comes from the Economist and explores the development history of national economies relative to that of the United States. 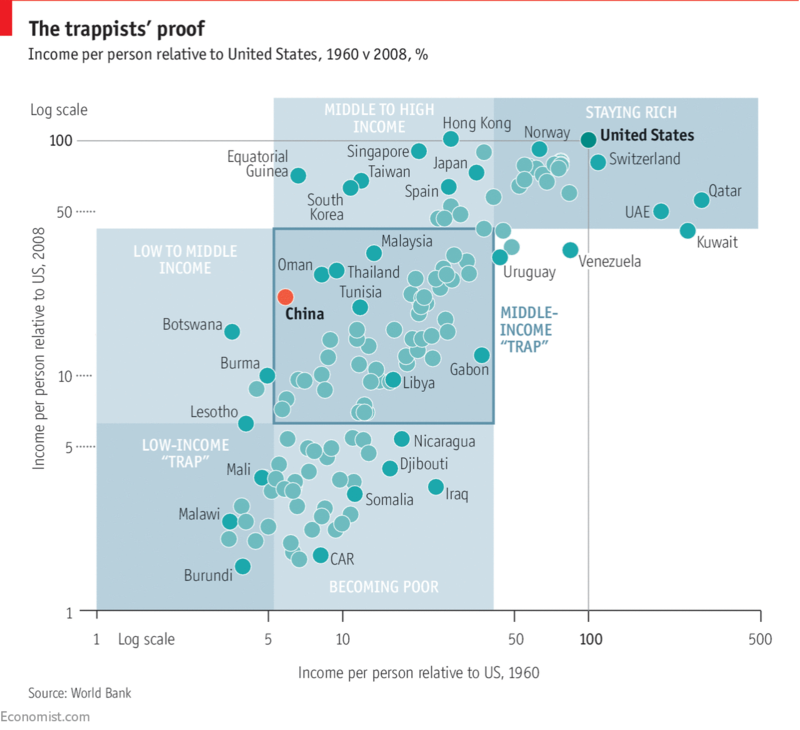 The point of the chart was to illustrate what the researchers determined was the middle income trap, a space in which countries develop and become semi-rich, but then can never quite escape. The Economist makes the point that the definition of middle income matters. The range is enormous and one statistic says that it could take 48 years to graduate at a healthy rate of economic growth. I wonder is this bit, however, could also have been charted. The show don’t tell mantra works well here for setting up the problem, but a chart or two showing that exact range could have supplemented the text and perhaps made it more digestible. Author Brendan BarryPosted on 16 October 17 16 October 17 Categories InfographicTags demographics, economics, Economist, income, infographic, information design, scatter plotLeave a comment on The Middle Income Trap? How Bad is the Rohingya Crisis? 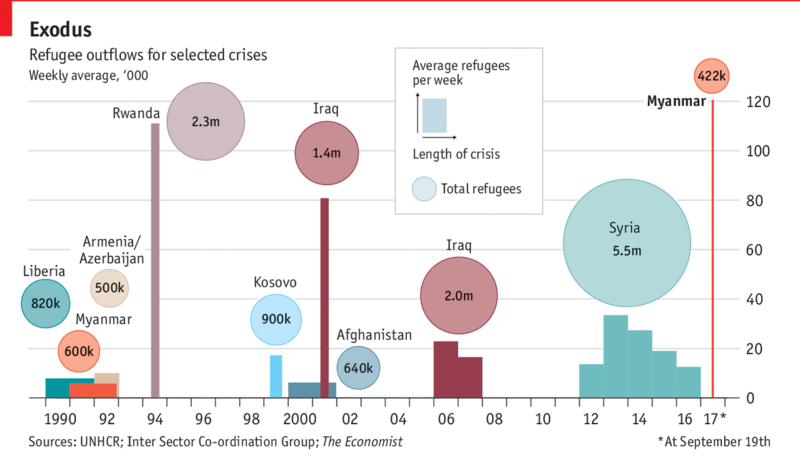 Less than a week after posting about the satellite views showing entire villages razed to the ground, we have a piece from the Economist looking at refugee outflows. And they are worse than the outflow of refugees during the Rwandan genocide back in 1994. To be clear, they are not saying that nearly a million people have been killed—though there is quite a bit of evidence to say the Burmese security forces are cleansing the state of Rakhine of one of its primary ethnic groups. Author Brendan BarryPosted on 27 September 17 25 September 17 Categories InfographicTags bar chart, Burma, critique, data visualisation, demographics, Economist, infographic, information design, Rohingya, timelineLeave a comment on How Bad is the Rohingya Crisis?